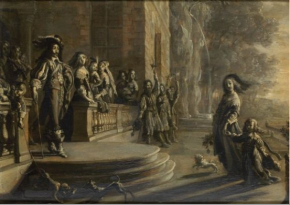 8/11/10 – Acquisition – Paris, Musée du Louvre – The Louvre preempted a small grisaille representing Louis XIII Welcoming Queen Anne of Austria and the Dauphin of France, Louis, at an auction (SVV Kahn-Dumousset), on Wednesday 27 October for the price of 18.500€ (without charges). Attributed to Jean de Saint-Igny, this panel also recalls Juste d’Egmont and we must keep in mind that many of the works previously attributed to the former are now acknowledged as being by the latter. In fact, this work may be compared to another painting on wood, Louis XIII, Anne of Austria and the Dauphin Offering the Kingdom of France to the Virgin of the Nativity, donated to the Louvre by Eric Coatalem in 1996. It is a preparation for an engraving, also a possibility for the panel acquired at auction. Although the works are very similar, by the grisaille technique, subject, style and size, the scale of the figures is different. Whether the work is by Saint-Igny or Juste d’Egmont, reuniting the two paintings in the same collection was a discerning choice.